The warming of the climate system is unequivocal, as it is now evident from many observations. Most of the climatic warming caused by human activities; include in particular the burning of fossil fuels that generate the 'greenhouse' gases. The transport sector is one of the most important causes of the high levels of air pollution. Alternative gaseous fuels relates to a wide range of fuels that are in the gaseous state at ambient conditions, whether when used on their own or as components of mixtures with other fuels. Exhaust gas recirculation (EGR) is one of the principal techniques used to control spark ignition NOx. However, EGR has different effect on performance, combustion, and emissions production that are difficult to distinguish.The knock characteristics in a single cylinder SI engine were investigated under high load operation and higher useful compression ratio with cooled EGR addition. Liquefied petroleum gases (LPG), natural gas (NG) and hydrogen gas were used as fuels. 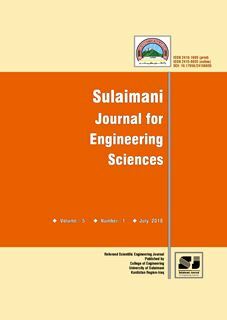 In this paper, practical analysis has been done to predict the influence of cooled EGR on engine knock by changing some operational and design parameters such as equivalence ratio, spark timing and compression ratio.أن ارتفاع حرارة نظام الطقس واضح وجلي اليوم عبر عدة مشاهدات، فمعظم السخونة الموجودة ناجمة عن فعاليات بشرية، من ضمنها احراق الوقود الأحفوري المولدة لغازات البيت الزجاجي. وفي المناطق المدنية يمكن اعتبار قطاع النقل أحد أهم مسببات المستويات العالية لتلوث الهواء. يرتبط الوقود الغازي البديل بمجال واسع من أنواع الوقود تكون بالحالة الغازية في ظروف الجو الطبيعية. ويعتبر تدوير الغاز العادم أحد التقنيات الأساسية المستخدمة للتحكم بملوث NOx الناتج من محرك اشتعال بالشرارة، ولتدوير الغاز العادم تأثيرات مختلفة على الأداء والاحتراق وانتاج الملوثات التي من الصعب تميزها. تمت دراسة مواصفات الطرق للمحرك لظروف تشغيل بحمل عالي لمحرك اشتعال بالشرارة احادي الاسطوانة عند أعلى نسبة انضغاط مفيدة باضافة تدوير للغاز العادم المبرد. تم استخدام الغاز النفطي المسال والغاز الطبيعي والهيدروجين كوقود. لقد تم في هذة الدراسة تحليل عملي لتأثير تدوير غاز عادم مبرد على طرق محرك مع تغيير بعض العوامل التصميمية والتشغيلية مثل النسبة المكافئة وتوقيت الشرر ونسبة الانضغاط. spark ignition engine --- cooled EGR --- knock --- gasoline --- LPG --- NG --- hydrogen --- compression ratio --- equivalence ratio --- spark timing. The research studies the loss of a lot of the architectural characteristics of the heritage and historical buildings in the Kurdistan region of Iraq. The Great Mosque is one of these buildings, in the old city of Duhok, which is adopted as a model for the study, as it represents the personal and the urban architectural identity of the city. The research emphasis on the importance of the architectural heritage of the city of Dohuk over different periods, particularly the Great Mosque, the landmarks was completely removed due to the negligence of Architectural Conservation, in addition to the renovation and modification that got the mosque through the completely redone during the seventies of the twentieth century. So the research aims to reach the original drawings of the mosque (before the modification and renewal processes), by following the analytical method based on a historical survey of the mosque and the region, containing historical documents, photos and interviews with scientists, historians, residents of the region, and visitors to the mosque before the renovations.تتمثل مشكلة البحث في فقدان الكثير من الخصائص المعمارية للمباني التراثية والتأريخية في أقليم كوردستان العراق، ومن ضمن هذه المباني الجامع الكبير في مدينة دهوك الذي إتخذه البحث نموذجا للدراسة باعتباره يمثل الشخصية والهوية الحضرية والمعمارية للمدينة. فيأتي هذا البحث تأكيدا على أهمية التراث المعماري لمدينة دهوك عبر الفترات المختلفة، وبالأخص الجامع الكبير الذي أزيلت معالمه بالكامل نتيجة الإهمال أعمال الحفاظ المعماري بالإضافة لعمليات التجديدوالتحوير التي حصلت على الجامع من خلال إعادة بناءه بالكامل الال السبعينات من القرن العشرين مما أدى إلى فقدان الجامع لمعظم معالمه المعمارية الأصلية. لذا يهدف البحث التوصل إلى المخططات الأصلية للجامع )قبل اجراء عمليات التحوير والتجديد(، من خلال إتباع المنهج التحليلي المستند على المسح التاريخي للجامع وللمنطقة والمتضمن الوثائق والصورالتاريخية والمقابلات الشخصية مع العلماء، المؤرخيين،ساكني المنطقة، وزائري الجامع قبل إجراء عمليات التجديد عليه. Facebook is one of the social networks which have lots of users among Kurdish people. Although there are no formal or published statistics about the number of the Facebook users, in the last few years Facebook was the most used website among Kurdish society. This swift development of the Kurdish society towards Facebook imposes new challenges that need to be addressed. For example, a poem or an article published on Facebook possesses properties such as author name, gender, age, and nationality among others. In this paper the gender of Kurdish authors in Facebook determined by using a feed-forward artificial neural network model. 120 Facebook Kurdish written posts were used for learning the model designed to determine the gender of Kurdish writers in Facebook. The posts were taken from Facebook pages of different persons with different backgrounds. Twenty eight text features were extracted from each post; these features were distinct in discriminating between genders. The feed-forward back-propagation artificial neural network with three layers (28 nodes, 14 nodes, 1 node) is used as a classification technique. The accuracy ratio which based on the ten-fold technique (taking the average ratio among ten trials) obtained was 77.5 %. This proposed idea of this paper is important for detecting the real gender of Facebook page owners.فةيسبووك يةكيَكة لة تؤرِة كؤمةلاَيةتييةبةناوبانطةكان ، لة ناو خةلَكى كوردستانيشدا بةكارهيَنةريَكى زؤرى هةية. لةو ضةند سالَةى دوايي دا تيَبينى دةكريَت كة فةيسبووك ئةو ويَبسايتة بووة كةزؤرترين كةس لة كوردستاندا سةردانيان كرددوة. ئةو طةشةسةندنة خيَراية هةنديَك رِةهةندي نويَي بةدواى خؤيداهيَنا بؤ نموونة كاتيَك ثؤستيَك يان نوسينيَك لةسةر لاثةرِةى فةيسبووكى تايبةتى كةسيَك بلاَودةكريَتةوة،هةلَطرى هةنديَك سيفاتى خاوةنى نووسينةكةية كة دةتوانريَت بدؤزريَتةوة وةك جيَندةر يان تةمةنى كةسى نووسةر يان ئايا خةلَكى ضي دةظةريَكة.لةو تويَذينةوةيةدا هةستاوين بة ديارى كردنى رِةطةزى ئةو كةسةى كة ثؤستيَك بلاَو دةكاتةوة لة فةيسبووك لة رِيَطاى شيَوازى نووسينةكةيةوة بة بةكارهيَنانى تةكنيكة ذيريةكان وة هةلَيَنجانى زانيارى لة تيَكست. هةستاين بة كؤكردنةوةى 121 ثؤستى جياواز كة هى كةسانى جياواز بوون لة شيعر و نووسينى كوردى، 28 خاسيةتى جياواز لة هةريةكة لةو بابةتانة دةرهيَنران، وة مؤديَلَكى ذيري تايبةت كة)نيورِةلأ نيَتؤرك - Neural network ( تيايدا بةكارهيَنرابوو ئامادةكرا. دواتر مؤديَلةكة فيَركرا كة هةستيَت بة جياكارى لةنيَوان رِةطةزى نوسةر لةسةر بنةماى نووسينةكةى واتا ئايا نووسةر نيَرة يان ميَ ية؟ % رِيَذةى دروستى خةملاَندنةكان بريتى بوو لة 77.7 )ريَذةى ناوةند لة دة جار دا بة ريَطاى Ten-fold (. ئةو تويَذينةوةية طرنطة بؤ ئاشكرا كردنى ئةو كةسانةى كة لة تؤرِة كؤمةلاَيةتي يةكاندا هةلَدةستن بةطؤرِينى كةسايةتى خؤيان وة لةوانةية ضةندين كارى ساختةكارى ثيَ ئةنجام بدةن. Soil temperature varies both diurnally and seasonally and can determine the temperature gradient within the collector loops of the ground source heat pump. To study spatial and temporal variations of soil temperature besides investigating the possibility of using underground soil temperature of the region for the installation of ground heat exchange systems, the current study was conducted. Soil temperature was measured at two locations in Erbil city/ IKR during the period from November, 1st, 2012 to February, 28th, 2013 with temperature sensors inserted in the ground at different depths. . It has been observed that during January and February the soil temperature offered the highest and lowest fluctuations respectively and they were closely related to ambient air temperature. The results also indicated that soil temperature increased with increasing depth up to a depth of 3.5 m in most cases and thereafter started to decrease with increasing depth. Furthermore, it was shown that the reliability of soil temperature prediction from air temperature decreased with the increase in soil depth. Positive differences at a depth of 3.5 m February ranged from 13.73 to 21.56 oC during the winter season from December to. The results can be valuable in planning for preheating system during the cold seasons.تخضع درجة حرارة التربة للتغيرات اليومية والموسميةوهى تحدد الانحدار الحرارى ضمن حلقات انظمة التدفئة. من اجل دراسة التباين الزمانى والحيزى لحرارة التربة فضلا عن امكانية استخدام حرارة باطن الارض لاغراض التدفئة قيست درجة حرارة التربة فى موقعين داخل مدينة اربيل/اقليم كردستان العراق ضمن الفترة المحصورة ما بين شهرى تشرين الثانى 2102 وشباط 2102 باستخدام مجسات حرارية منصوبة على اعماق مختلفة. لوحظ اعلى واقل تذبذب لحرارةالتربة خلال شهرى كانون الثانى وشباط على التوالى واستجاب التذبذب الحرارى الى تذبذب حرارة الهواء بصورة وثيقة. كما اشارت النتائج الى ازدياد حررارة التربرة مرع ازديرادالعمق الى حد 2.3 م وبعدها بدأت بالانخفاض، و عرلاوة علرى ذلك لوحظ بأن دقة التنبؤ بحرارة التربة من حرارة الهواء تقرل بأزدياد العمق. كما وان وجود فروقات معنويرة موجبرة برين حرارة التربة وحرارة الهواء فى المدى ما بين 02.32 و 20.32 م 1 عنررد العمررق 2.3 م خلال شهرى كانون الاول وكانون الثانى قد تساعد فى استخدام حرارة باطن الارض لاستخدام التدفئة خلال المواسم الباردة. Identity represents the priority in our contemporary communities since nothing more than identity satisfies the individual's quest to achieve his global existence through his belonging to a large unit that embraces him. Since architecture is the civilized expressive outcome of community's ideology, identity has been the subject for many studies and research, and has been studied and researched by many philosophers and critics from different perspectives. Since the concept of identity tackles different knowledge fields, it has added a diverse impression on our contemporary architecture in general and in Kurdistan in specific and is characterized by constant change impacted by technical, economical, political and social factors. The exposure of Kurdistan to the effect of economic expansion and the development of technology, mass media, and communication had an effect on the existence of an architectural style characterized by rapid change. This caused first governing the architectural shape resulted from frequent ideology and the different expressions of considerations to our environment (and this is through the international modern trend). The governing of west civilization increased in all domains architecture being one of them to the extent that it controlled the privacy of architecture. From this point, the research came to show the architectural identity in Kurdistan Region.تمثل الهوي ة المرتب ة الريسس سة ف ي معتمعاتن ا المعاصرة اذ لا شئ يغن ي انسس اا الد رد ع هاجس السعي الى تحقسق وجوده العماعي م خ لال استماي ى ال ى وي دة ملس ة تش تمل علس ى وتحتويى ولاا العمارة هي ذلك النتاج الحضاري المعبر ع فكر المعتمع فقد شكل مدهوم الهوية موضوعا للعديد م الدراس ا والابحاث , مما اسى فسر وبحث م قب ل العدي د م الدلاس دة والنقاد وم مختلف وجها النظر, سظرا لك وا مده وم الهوي ة يم س مختل ف المع الا المعرفس ةي اا مثس را م العوام ل ساعد على اسباغ طابعا متنوعا على عمارتنا المعاصرة بشكل ع ام وف ي اقل سم مردس تاا بش كل خ ا , تمس ب ا لتغسر المس تمر, مت برا بعوام ل اجتماعس ة وسساس سة واقت ادية وتقنسة, يسث ماا لتعرض موردستاا الع را لت بسر التوس ع الاقت ادي والتطور التكنلوجي وتطور وسايل الاعلام والات ال ابر في وجود ط را معم اري س ريع التغس ر, تس ب اولا ف ي سسطرة شكل معماري سابع م فكر متكرر وساتج ع اي لا اق ل تقدير للاعتبارا الملايمة لبسئتنا )وذلك م خ لال التس ار الدولي للعمارة الحديثة( وبذلك ت ايد سدوذ الحضارة الغربسة في م ل المس ادي منه ا العم ارة ال ى الح د ال ذي طغ ى فس ى عل ى الخ وصسة في العمارة ي وم هنا اتى البحث لتشخسص واق ع الهوية المعمارية في اقلسم موردستاا العرا . Philosophy of education --- curriculum --- secondary schools --- design characteristics. --- فلسفة التعليم،المناهج التعليمية،المدارس الثانوية، الخصائص التصميمية.